Depart Arusha by scheduled flight to the remote regions of Tanzania’s northern Serengeti. Upon landing here, you realize the sheer scale of the scenery and the amazing views from your room. Settle in and enjoy lunch with the plains rolling out before you. Enjoy an afternoon game drive around the kopjes in search of big cats before returning to the camp for a sundowner and dinner. Full day at Lamai Serengeti. When one of the largest animal migrations in the world crosses your door step for several months of the year, as it does at Lamai Serengeti between July and October, it's sometimes easy to overlook what all of us who have spent so long in the Serengeti keep reminding ourselves. It's not all about the migration. To define the Serengeti purely in terms of the wildebeest timetable is to massively underestimate the variety of this part of Africa. Throughout the year, the lodge uses 4x4 s to explore the variety of terrain, both south of the Mara River and (river state permitting) to the north. They’re able to offer short bush walks when the grass is low enough to make walking safe. The topography lends itself well to being on your feet; small valleys, river lines and rocky kopjes make for frequent changes of scenery...and great cover for approaching unseen wild animals. Early morning game drives with a picnic breakfast under a lone tree, watching a family of elephant gently grazing in the open grassland - this is a sort of freedom that is hard to imagine. Lunch and a swim back at camp and an afternoon game drive and sundowner on the Mara River. Depart the Serengeti on a scheduled flight arriving in Mahale around lunchtime. Light lunch on the dhow, a traditional sailing vessel, as you head down the lake to Greystoke Mahale. Settle into camp, or loosen up with a short walk in the forest followed by sundowners looking across Lake Tanganyika to the Congo beyond. Chimp tracking! As news comes in from the trackers, head off into the forest in search of your first group of chimps. As well as time spent watching the chimps as they play, groom and possibly even hunt, you should see other forest game as well as amazing birds, butterflies and plants. A full day at Mahale. 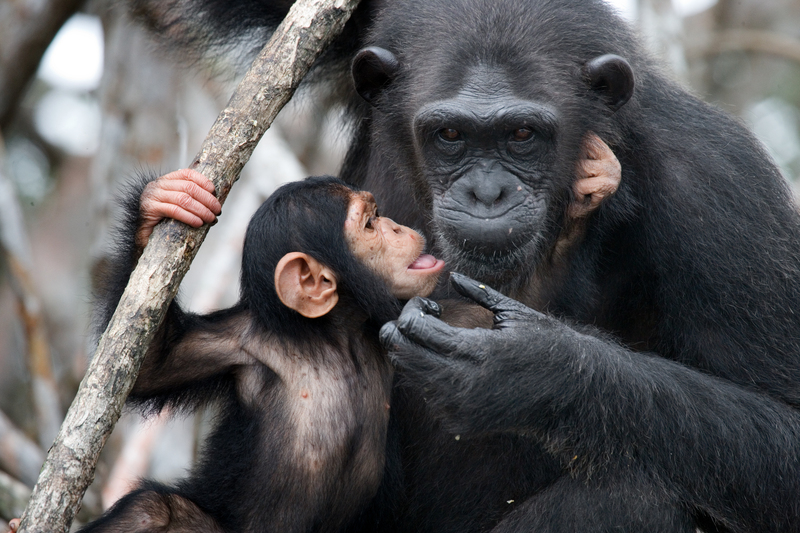 You'll be able to spend time chimp trekking on each full day you're in Mahale. In addition, there'll be the chance to go for deep water swims, fish in the lake, kayak or just head up to one of the amazing waterfall pools in a quiet corner of the forest. A last trip into the forest followed by sundowners & sashimi on the dhow and dinner on the beach under a ceiling of stars.